60,000 points Earn 60,000 points after you spend $3,000 on purchases in the first 3 months your account is open. 2X 2 points per $1 spent on Southwest® purchases and Rapid Rewards® hotel and car rental partner purchases. Business travelers loyal to Southwest. 60,000 points is the biggest signup bonus offered on a Southwest card, and this one tacks on 6,000 anniversary bonus points as well. Compare this to other top business credit cards, including airline cards for businesses. 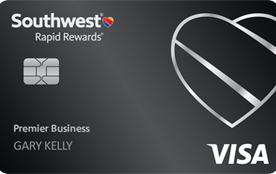 Our take: The Southwest Rapid Rewards Premier Business credit card is a high-value airline card that makes it easy to earn flights, gift cards, rental cars and more.